The Taylor Hammer is a popular medical instrument designed to test ones reflexes. 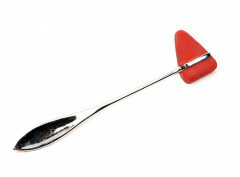 This rubber headed hammer can be used to add a tapping stimulation almost anywhere during medical fetish scenes. The Taylor Hammer is a popular medical instrument designed to test ones reflexes. In medical play the Taylor Hammer provides many options from checking ones reflexes to mild percussion play. Taylor Hammers are one of the more common instruments used to test reflexes in real life. Each Taylor Hammer has both a 3/8 inch and a 1 1/2 inch rubber hammer head for testing reflexes. They are great medicaltoys for both mild percussion play and physical & examination scenes. Can be cleaned with anti-bacterial dish soap and rubbing alcohol, then just allow to air dry.